Another must-visit destination on our London Weekend of Eating, was Nopi, a restaurant from the team behind the Ottolenghi cafes. Nopi is similar to Ottolenghi, in that the menu is focused on fresh ingredients, with culinary influences from a broad variety of countries, but served in a more formal setting. We came here for dinner on the Saturday night (that is, after lunch at Dinner by Heston, Oxford street shopping, a McVities themed supermarket sweep in Clapham, and a mad dash back to our respective accommodations to drop off the shopping and get changed!) The only booking I'd managed to snag was at quarter past nine (booked online pre-trip), but luckily the late booking ended up suiting us well. Nopi felt like quite an oasis of calm, especially after the braving the madness of nearby Piccadilly Circus to get there. (Piccadilly was even crazier than usual, thanks to the Champions League final being on that night!) The muted lighting, marble and brass fittings and pretty floral arrangements all contributed to a lovely relaxing atmosphere. 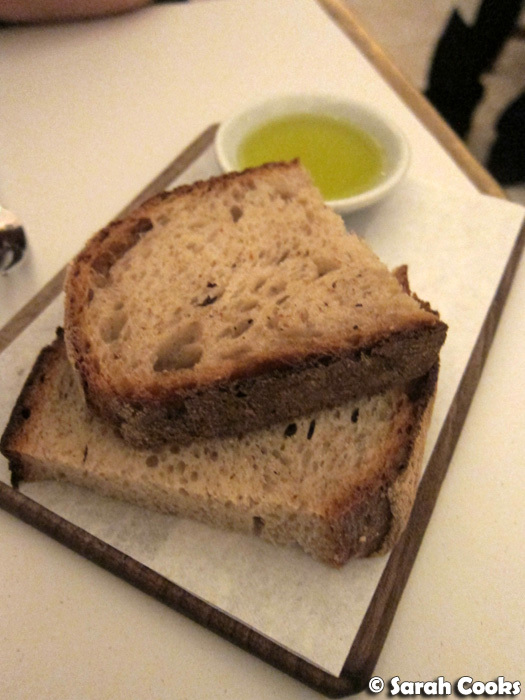 The bread was served (controversially, at the time) with a little bowl of grassy olive oil, and was the hearty, chewy type - perhaps a mixed-flour sourdough? Either way, very nice. The savoury menu is divided into four sections: nibbles (think: spiced nuts, marinated olives, all under £6), starters / dishes to share (£8.50-£12.50), a concise list of five mains (£17-£29.50), and sides (all £4.50). Whilst helping us navigate the menu, our waiter actually recommended that we order a total of eight to ten of the smaller sharing dishes for the two of us, which had me panicking that they'd be tiny and that we'd be in for a massive bill! We decided to order one "Nibble", and four dishes from the "Starters / Dishes to Share" section of the menu (two vegetarian, one meat, one fish) to start, reasoning that we could always order more if we were still hungry, but it would be more awkward to cancel dishes if we were full. I'm glad we restrained ourselves - the amount of food was perfect, and left us room for a dessert each. The Dishes to Share are definitely the focus of the menu, and vegetables and grains seem to feature more prominently than meat - I wonder if some customers have complained of not feeling full? On reflection, I think that maybe the "mains" section of the menu has been added to satisfy those customers who don't go in for all that sharing nonsense and expect a Big Plate All To Themselves! 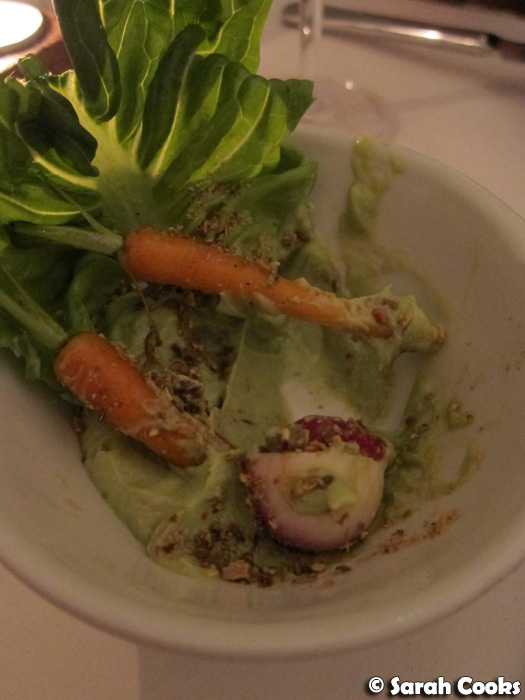 These vegetable crudités were from the "nibbles" section of the menu - I loved the cute presentation. (The avocado is at the bottom of the bowl.) 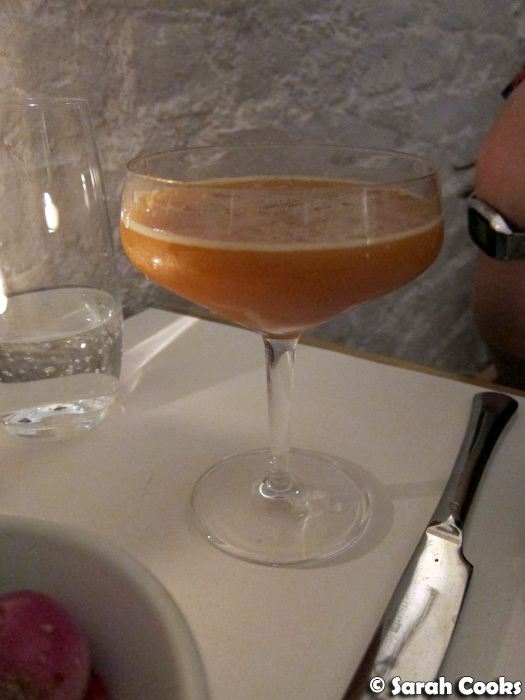 At this point, my friend Clarice mentioned that she'd never had dukkah before, which I found really interesting. Here in Australia it's almost passé, loads of restaurants serve it with bread and olive oil, and you can even get it at Coles! Clarice is most definitely a food-lover, but perhaps dukkah's just not that popular in France, where she lives. 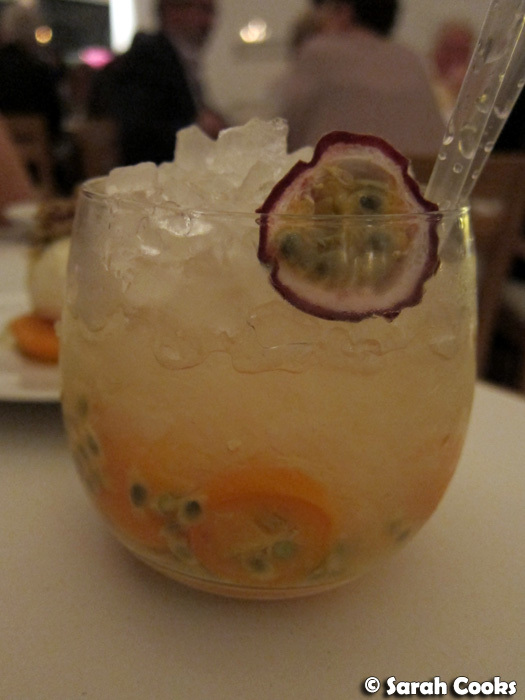 Don't you find it interesting how food trends differ across the world? (Or is that just me?) Ok... moving right along... look, avocado! I adore burrata, so I had to order this dish. I was a bit skeptical about the use of lavender oil, but it was subtle, not overpowering the mild, creamy burrata. The coriander seeds had been toasted and salted, providing a nice textural contrast. 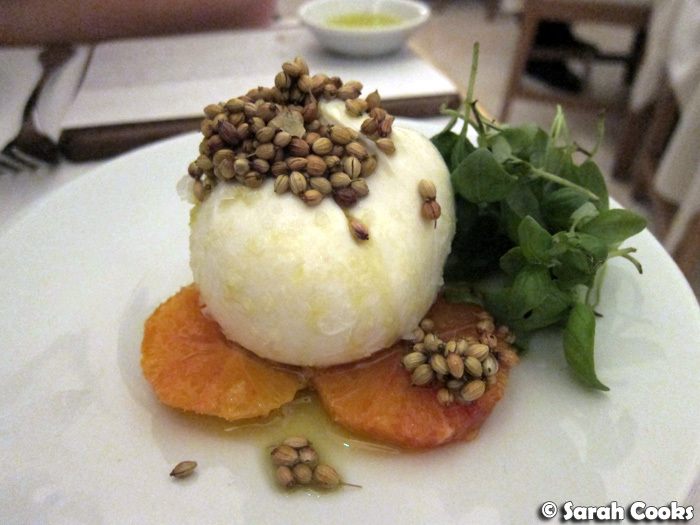 Finally, the sour blood orange and pungent basil leaves cut through the richness of the burrata - an excellent dish. 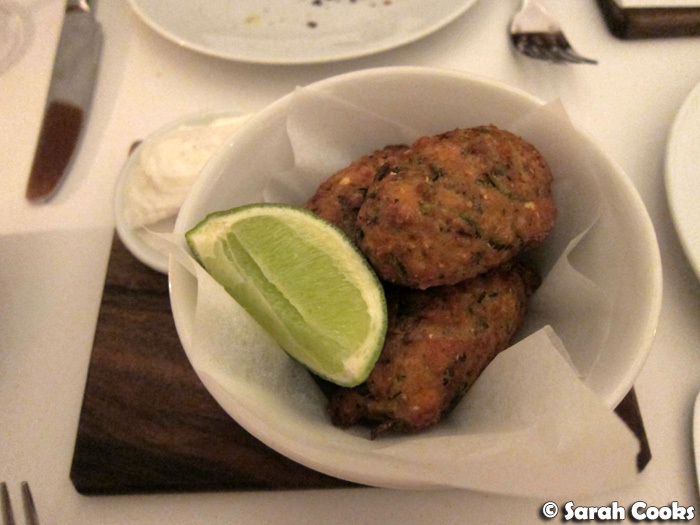 These courgette and manouri fritters felt very "Ottolenghi" to us, hehe. They were soft and gently spiced, with nice pops of saltiness from the manouri. The accompanying cardamom yogurt was also great, and I made sure to scrape out every last bit! I wasn't quite as impressed by the meat dishes as I had been by the vegetarian starters, but I think that's partly because the vegetarian starters we ordered had set an extremely high standard. Whilst every element was cooked very skilfully (and you can see the perfectly pink duck dish at the top of this post), they just didn't stand out for me. 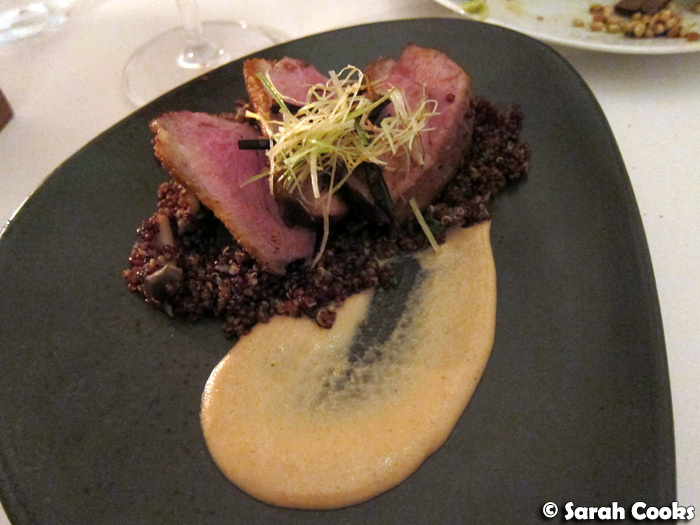 In particular, I found the slightly bitter taste of the beer sauce served with the duck to be a bit jarring. However, Clarice liked the dishes very much, so it seemed to be more of a personal preference thing than anything else! 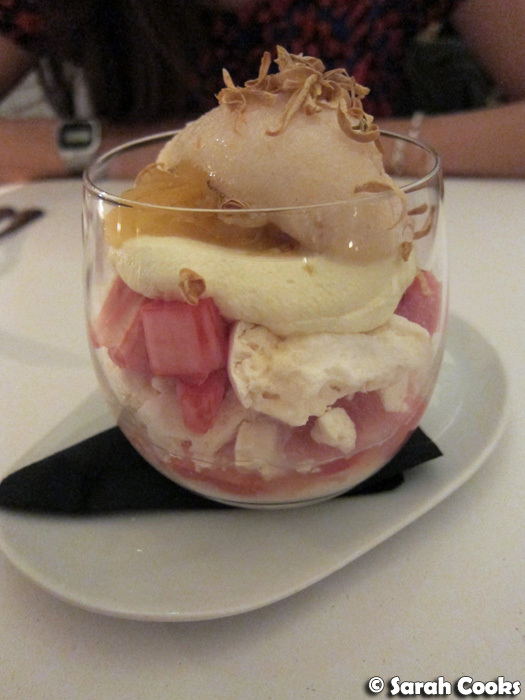 We really loved the rhubarb mess, particularly with the addition of fragrant lychee sorbet. 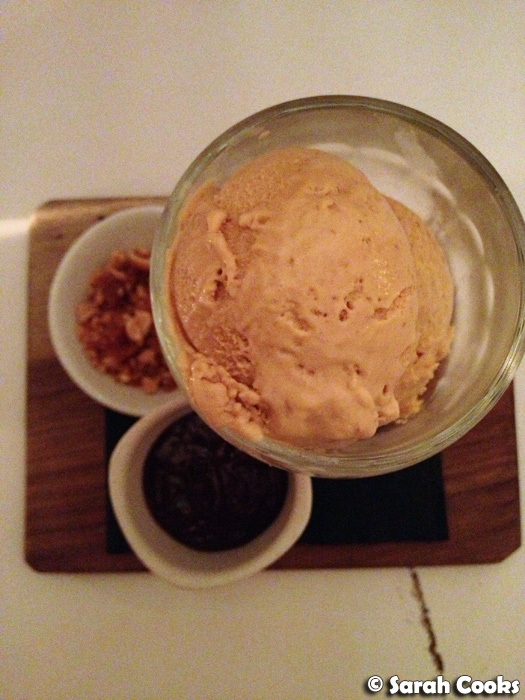 The whole dessert was so light and so delicate - highly recommended! And that was our dinner at Nopi! I felt the prices were very fair - with a very good exchange rate of $1.6AUD to the pound at the time, the cocktails worked out to be about $18, the meat dishes were under $20, and the desserts were $12-14, which is similar to, or even less than, what you'd pay at a similarly upmarket restaurant in Melbourne. 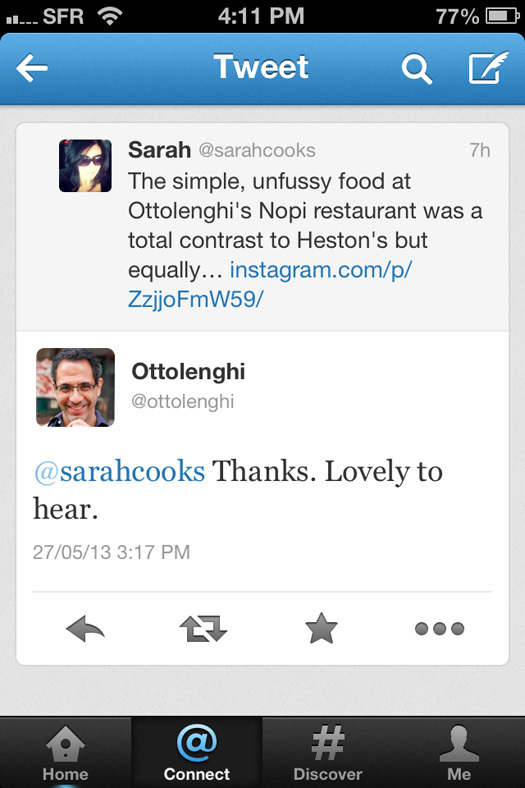 Obviously I'm not a Londoner and don't earn pounds, so I can't compare Nopi to other London restaurants, only to Melbourne restaurants. Just FYI, the lady who owns the flat I stayed in said she finds Nopi a bit expensive for what you get. I'd definitely recommend Nopi for a great meal, but to be honest, I don't know if I'd personally visit again the next time I'm in London. 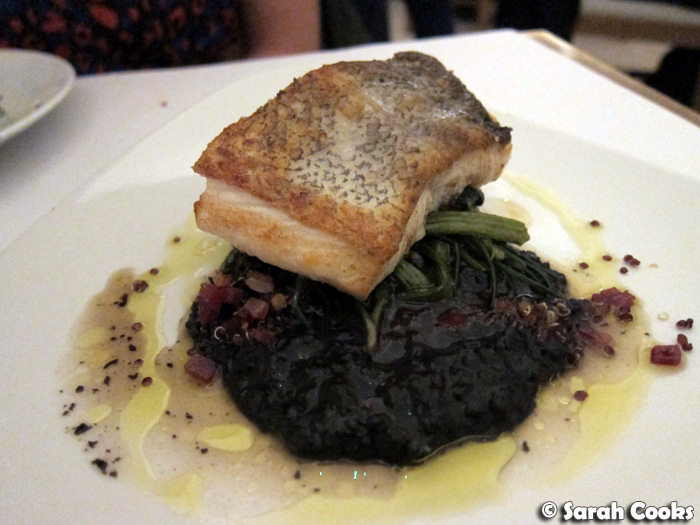 You see, the dishes I enjoyed the most were the ones that were similar to the ones served at the Ottolenghi cafe (which I totally love, and is absolutely on my permanent must-visit list! ), and my time in London is always so limited - too many great places to visit, so little time! 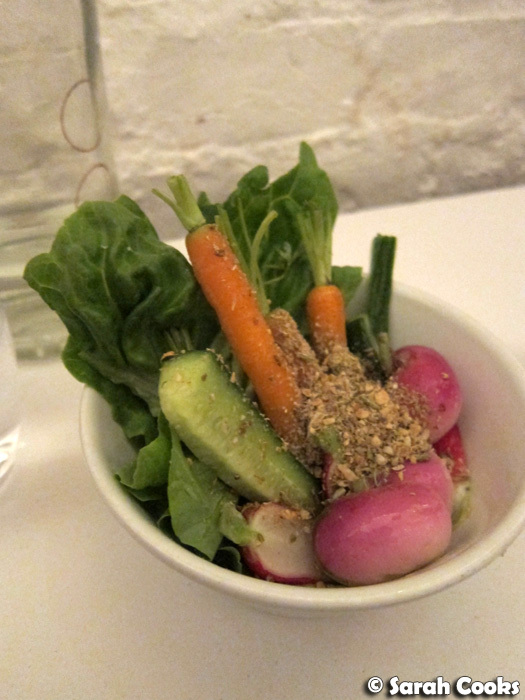 I love places that celebrate the deliciousness of vegetables, purely, with something like that crudite dish. But, really, it's the desserts that would steal my heart here! Eeeeeeee he spoke to you!!! eeeeeeeeee.. I wish London was nearer to us! OMG OMG OMG He tweeted back!!! That's so cool!!! YAY!!! Nopi looks great and I see Burrata my favourite!